I praised Michael Ramirez a few days ago for his clever political cartoons, so it’s time to “spread the wealth” and draw attention to a couple of superb cartoons by Chuck Asay (I think his hometown paper is the Colorado Springs Gazette). 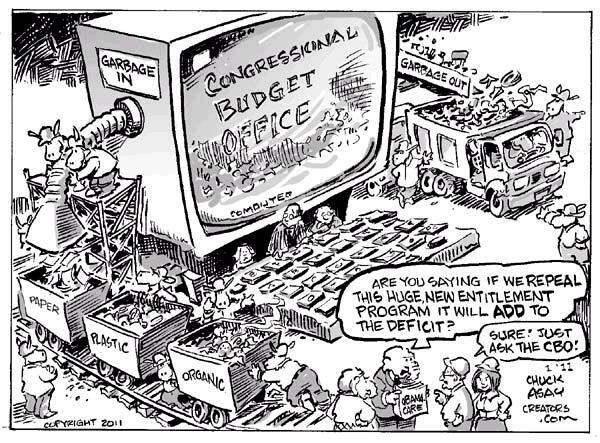 Since I’ve bashed the biased and inaccurate work of the Congressional Budget Office, I found this cartoon very amusing. 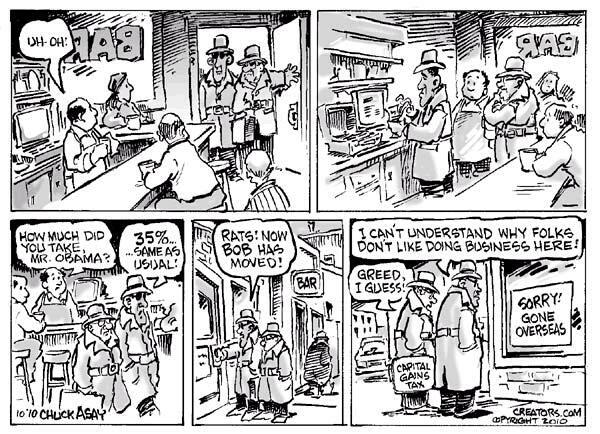 And this cartoon on business taxation is very appropriate after yesterday’s post about a potential corporate tax rate reduction from the Obama Administration. Unfortunately, he made that statement in Ghana and I assumed he only had supply-side feelings while outside of America. But I’m a believer in redemption, so maybe his corporate tax proposal will be good and the beginning of a journey in the right direction.